Since I'm no stranger to bag making, I couldn't help but alter the pattern to suit my personal tastes. The pattern called for one exterior open pocket. 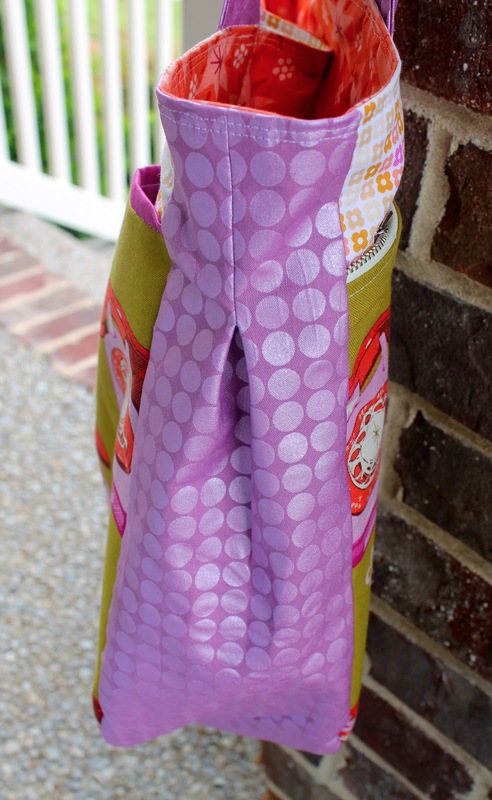 I made the exterior open pocket and I added this exterior zippered pocket too! I used a 14" metal zipper and it was the perfect fit with the pattern pieces! The patch work handles were a total "make it work" moment. I cut the gussets before the handles and, in the process, destroyed any hope of getting the required length necessary for the straps out of the purple dot (Mirror Ball dot) fabric. I had a few scraps left of the multi-floral print (Weekends) so I just added a bit to each strap I cut and, voila! perfect handle length! I also use a double stitch method for top stitching my handles to add a bit more detail. Another change I made was to fully line both exterior pockets. Anna's pattern has you use a facing to finish the pockets, but I like mine to be fully lined. Just a personal preference! Also, as you can see from this picture, I did not use piping along the top of my exterior open pocket. Instead, I cut the pocket lining a 1/2" longer than necessary, then, when I attached it to the exterior of the pocket, I left 1/4" of the lining showing on the front. I stitched in the ditch to keep it in place. Again, this was a "make it work" moment. I couldn't find premade binding in the right color and I didn't have the right size cording to make my own piping (plus, I hate cutting fabric on the bias), but I really love the hint of color at the top of the pocket! So I came up with the lazy girl's way to achieve the same effect. **update, Anna kindly pointed out that the piping fabric doesn't have to be cut on the bias since the piece it is being attached to is straight! Duh! silly me! I really love the gusset on this bag! It elevates it from a simple, flat tote (or one with boxed corners) to something way more polished! Plus, it gives you way more room inside the bag! You can also see my double top stitching along the top of the bag (like on the handles). This is simply a detail that I like. My largest pattern change was to omit the interior pockets and a method of closure all together. No matter how many times I put interior pockets in my bags, I never use them! Everything always ends up at the bottom of my bag! So I decided to save myself the fabric and just leave the interior plain. Also, I never close my bags! Whether there is a zipper or magnetic closure, I don't use it! So, again, I saved myself the time, effort, and fabric and omitted a closure. You can also see in this picture that I reinforced the handles all the way through to the lining of the bag. I'm super paranoid about a strap coming loose so in addition to Anna's instructions, I reinforced the handles after I assembled the bag. So there you have it! My Super Tote! I think someone needs to make a bag that looks like a Wonder Woman outfit because I keep envisioning this bag with a cape and super powers, don't you? Ok, maybe that's just me! Anna has really outdone herself with this bag. The pattern is awesome, the directions are easy to follow, and the finished project is perfect for a summer tote! Keep your eyes peeled on Anna's blog at the end of this month for her new *SUPER* pattern, the Super Tote!!!! I love your version and look forward to buying the pattern. I am alway worried about handles as well. What did you do to reinforce them? hmmm... maybe this should be my market bag? Can I just hire you to make me one instead??? 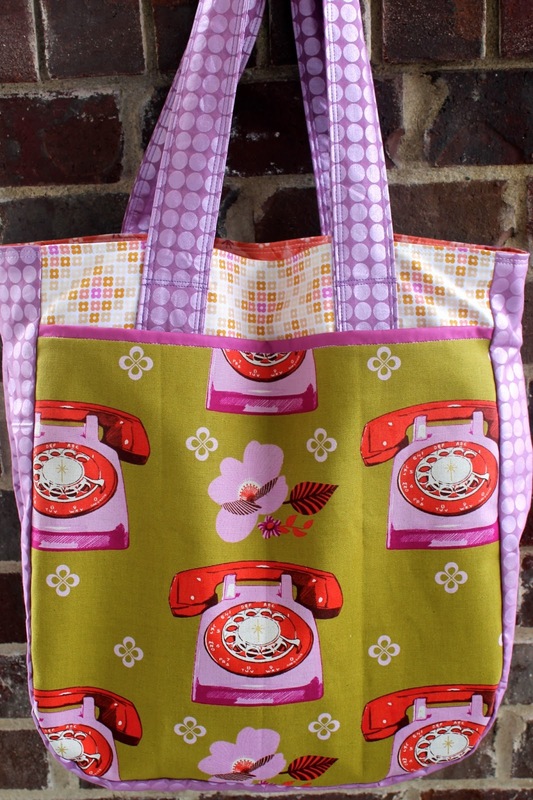 This looks fabulous - love the retro phone fabrics! I LOVE LOVE LOVE LOVE that zippered outside pocket. I so wish you could share how you did that. I am making this bag now and I will say I wanted that very pocket!!! I love it. The zip pocket is a very good idea ! I love your super tote & want to duplicate your zipper pocket. Could you explain how you sewed it? Do you do it like your zippered pouch? And, did you put it below the topstitching over the handles on the exterior body?